How lovely are these heart shaped coffee scoop and tea strainer? I love that they look like Cupid's arrows! 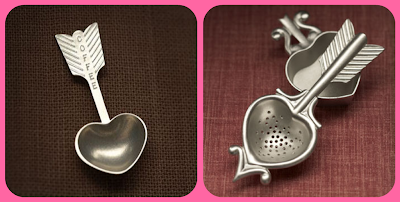 I know it's not anytime near Valentine's Day, but these would make an adorable bridal shower gift, wouldn't they? I would love to put these out when company comes; it would add that extra perk of loveliness to any tea (or coffee!) party.